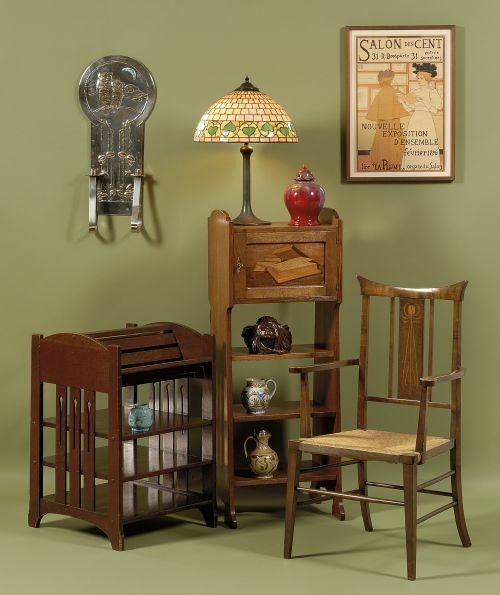 A New Collecting Trend | Antiques Dealers and Appraisers | Skinner Inc.
Richard Wright’s collection (Auctioned at Skinner in October 2009) focused on Art Nouveau furniture, but ranged from cold-painted bronzes to Doulton-Lambeth stoneware to arts and crafts lamps, and of course, antique dolls. Has anyone ever told you to stick to one, specialized collecting area? You can tell them a new trend is emerging, and diversification is the name of the game. I’m sure you’ve heard that a diversified investment portfolio is a good idea, but we both know that collecting stocks is not nearly the same as collecting antiques. The former usually demands a lack of emotion; the latter just the opposite. Diversification, however, can have equally positive results for both. I talked to a dealer recently who has been known for fine 18th and 19th century American antiques. Now, he’s mixing in things of different origin because he’s realized the need to diversify his own knowledge and his business model. Other dealers like Andrew Spindler in Essex, Massachusetts, sell things that, regardless of their medium, origin, and age, fit a certain aesthetic, often undefined but always cohesive. A few interesting Shaker pieces Skinner auctioned came from a circa 1970 architect-designed house filled with Shaker furniture and abstract art—a strikingly successful combination. Because established dealers are changing their aesthetic, and new dealers who think in new ways are emerging, I think collecting will follow on a large scale. What will result in time is not the traditional “period room” look of rigorously categorized collections that Winterthur and any number of English Country Houses put forth, but rather a more integrated, personal aesthetic. Ready to jump in on the trend? Buy a little of this, a little of that, aiming at making the whole better than the sum of its parts. Add part intelligence to part good old-fashioned gut feelings, and you’ll be on your way to a diversified collection. Of course, you should be ready to hit on some things and miss on others. Sometimes your gut outweighs your intelligence and you end up with Tiffany-retailed Italian silver trinket boxes in the form of miniature Shaker boxes, but that’s how it goes! This entry was posted in Blog and tagged antiques market, Art & Antiques, collecting antiques, Collecting Tips, collecting trend, dealers, diversification, English country houses, Market Trends, shaker furniture, winterhur by Chris Barber. Bookmark the permalink. I grew up with parents who were in the antique business and started to assist with the buying at the age of 14. I developed a diverse interest from an early age by attending auctions. I have never let go of this diverse interest and have collected a variety of items.Skinner’s Discovery sales have always been of interest to me.It is interesting to me that now this is the trend. It is certainly interesting and you develop a wide range of knowledge as you collect. Warren Planter said “all good things go together”. It is interesting to place Chase chrome on an Empire sideboard or a set of windsors around a Danish Modern extension table. If all things are true to their form and time they often work together. It is good to loosen some restrictions on ones collecting. It can give one a better sence of the history of objects, of how evolution sometimes works away from a source. Well said, Russ. Loosening restrictions is what it’s all about – trust yourself, trust your eye. I’ll follow your Planter quote with a Rilke paraphrase – a bond between things is stronger if those things are allowed to be individuals (he was talking about people, but the sentiment is the same). Happy collecting! (pony express) era boxes would be something of interest to your auction people. I have been mixing antiques with other things that appeal to me for a long time. In my case, most of those other pieces are primitive artifacts from what used to be called the “Third World”. I also get some other quirky things when I am out on the hunt. I think our abodes should say something about ourselves and what we find interesting. Nice to mix things, however knowledge is important if a collection is relevant…space in the average home is also limited…given the need for enlightened choices and the limited display space, choices have to be made and one really needs to edit…OTHERWISE THE RESULT IS JUST A MISMATCH OF COLLECTING MISTAKES DISPLAYED WITH BAD PERSONAL TASTE…I have seen too many collector’s spaces invaded by their passion and their desire for accumulation. The result is very cluttered and simply a meaningless sad reflection of ego. Diversify, yes, but remain focused and maintain quality…it’s tough to know about everything…if it’s a collection, it’s not just an interior.